AuxBeacon received this back on 29th March 2016, but staff members wanted to research it to verify. Family members of American volunteers in CAP Aviation History have donated many CAP artifacts to representatives who claimed they would forward these to CAP NHQ or other museums for public viewing. These representatives scan obituaries and then solicit the bereaved family members for donations. Forms have been created for this process. See Figure #1. Sadly, some CAP history profiteers have kept and/or sold donated artifacts for personal financial gain or advancement. When the magnitude of this fraud was brought to the attention of CAP National in 2011, SUSTAINED findings were covered up by appointed commanders and leaders behind the scenes. Those individuals who faithfully worked the investigation were removed from key positions and even from the organization. Col Merle Starr was removed as the CAP National IG and replaced by Col Ken Parris. Col George H. Ross III, USAF was removed as CAP-USAF Commander and replaced with Col Paul D. Gloyd II, USAF. 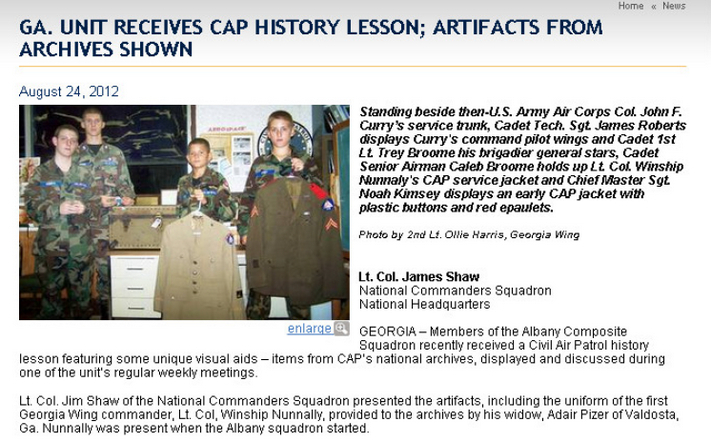 On May 17th 2009, Lt Col James L. Shaw of Albany Georgia, then a CAP Major and the CAP National Curator, posted a statement on a CAPTalk forum stating that he acquired the World War II era uniform of Winship Nunnally, CAP Georgia Wing’s first commander, for his “private collection.” In this post Shaw clearly states that the correct uniform has the Wing Commander label on the sleeve. See Figure #2. On March 16th 2010, A.V. 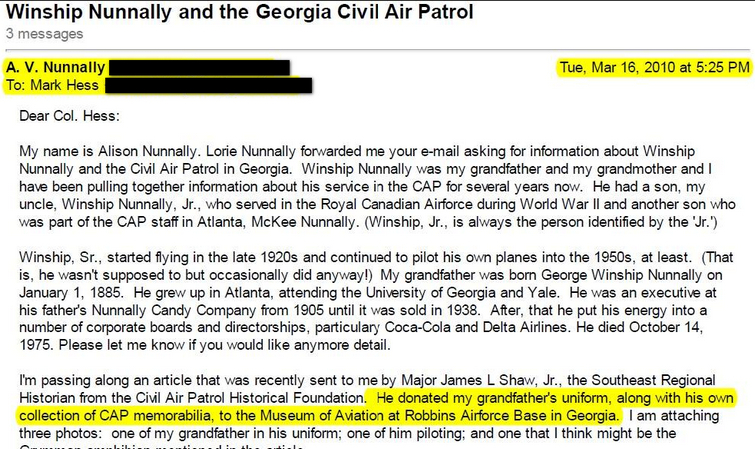 Nunnally stated that Lt Col Shaw told him that he had donated his grandfather’s uniform to the Museum of Aviation at Warner Robins AFB in Georgia. We encourage readers to call the Robins Museum of Aviation in Georgia to verify that Shaw’s statement to AV Nunnally is patently false. See Figure #3. 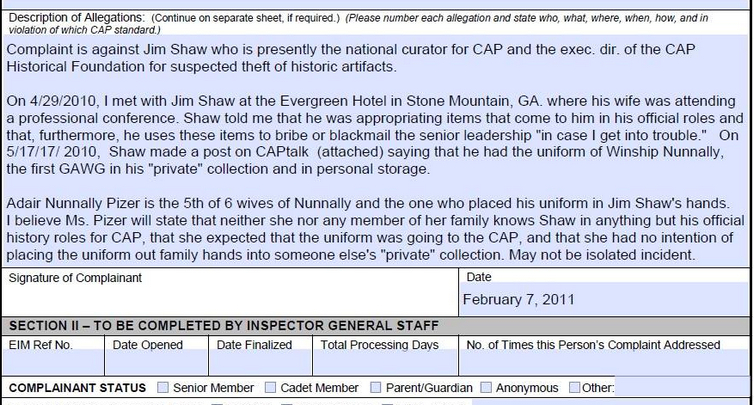 On February 7th 2011, an official CAPF-30 complaint was filed against Lt Col Shaw of Albany, Georgia over his private and public confessions of apparent theft of historic artifacts, including the Nunnally uniform. This complaint is not accepted and logged until March 13th 2011, over a month after its submission. See Figure #4. By June 12th 2011, CAP Inspector General Col Merle Starr had split the complaint into two separate cases and entered them into the ECIM (Electronic Complaints Information Management) System. They were designated as 2011 NHQ-463 for the complaint against Lt Col Shaw on the Nunnally Uniform and 2011 NHQ-464 for a complaint against the CAP History Foundation. At this time, NHQ admitted that it did not know where all of the items might be stored. AuxBeacon has verified this through multiple sources and has received written confirmation of the two separate filings. During a deliberate delay period between March and July of 2011, corrupt CAP officers and CAPHF personnel rushed to destroy evidence, move artifacts around and pressure Col Merle Starr to drop the complaint. These individuals directly interfered with an IG investigation and this will soon be addressed in a follow-up entry on AuxBeacon. On August 17th of 2011, Maj Gen Amy Courter exits her position as the CAP National Commander and is replaced by Maj Gen Charles L. Carr. The investigation into a decade-plus long theft of CAP artifacts is finally allowed to proceed but without having Maj Gen Courter as the final judge. Maj Gen Courter will soon be covered in a separate analysis. On August 31st of 2011, the IG investigating officers assigned to the complaint advised in writing that investigation of the original complaint would be allowed to proceed. In September of 2011, the IG investigating officers advised the complainant that the accusations against Lt Col Jim Shaw would be SUSTAINED and that he was “headed out” and that the complainant efforts and suffering would be vindicated. AuxBeacon has the evidence of these communications. On October 3rd 2011, Lt Col Jim Shaw delivered an official letter of resignation with an effective date of October 31st 2011. The rationale was that he was accepting a new paid position elsewhere, but also that he would “remain” as CAP’s National Curator. CAP National addressed this in an e-services broadcast regarding leaked information to News of the Force. AuxBeacon has evidence from within the IG system that this statement is not true. Lt Col Shaw was removed from his position as National Curator as documented in writing by an IG. See Figure #5. 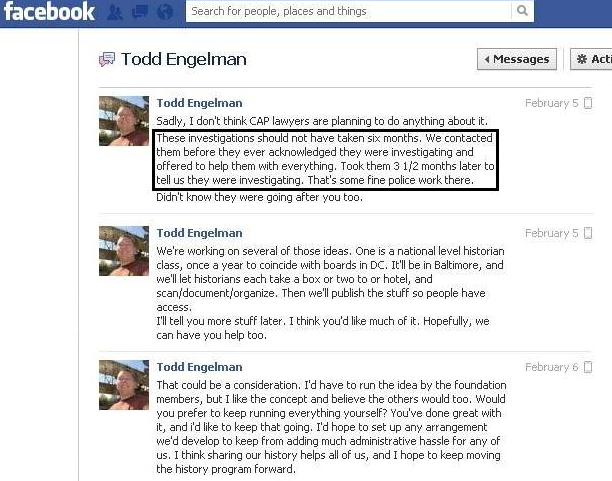 On February 5th 2012, Lt Col Todd Engelman revealed, in writing, that he was aware of the investigation and that it took the CAP investigators 3 1/2 months BEFORE there was any communication that an investigation had begun. He and others in the history program directly interfered with an IG investigation and tried to stop the investigation from proceeding forward. See Figure #6. 3. Revealing that National Curator, James L. Shaw would receive a verbal counseling. See Figure #7. The findings of the investigating officers and the CAP Inspector General were that the complaint against Shaw should be SUSTAINED and AuxBeacon now has these communications in writing. On August 6th 2012, the Dayton Daily News ran an article with information delivered to the author by multiple officers in Civil Air Patrol’s History Program regarding the abuses found by CAP Inspectors as reported to Maj Gen Carr himself, who felt the need to give a verbal counseling to Jim Shaw. Yet to the press in this article, “There was no evidence of wrongdoing whatsoever,” Maj Gen Carr said. “I can assure you that if there was any evidence of wrongdoing, actions would have been taken.” See Link. The Civil Air Patrol investigated those allegations and completed an internal report in March , but refuses to make the findings public. The CAP contends that this is a private matter not subject to public scrutiny [even though 87% of CAP’s funding is from the Federal Government]. AuxBeacon has received contributions now showing that this is not the first, nor only time that Maj Gen Carr would work to conceal the evidence of complaints filed against corrupt CAP officials. 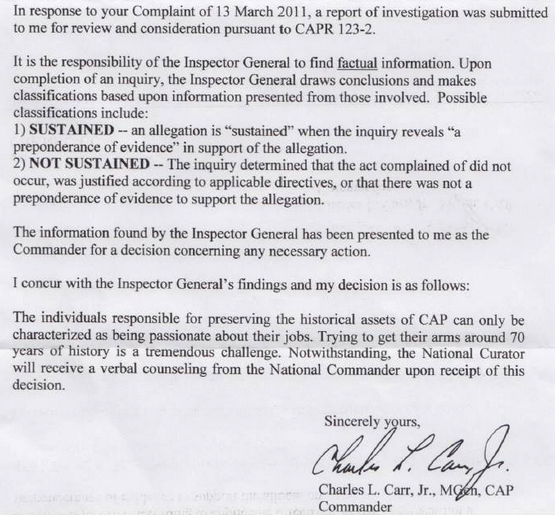 In fact, nearly every IG Complaint between February 2012 to August 2014 was delayed, blocked, ignored or not investigated during Maj Gen Carr’s term as National Commander. 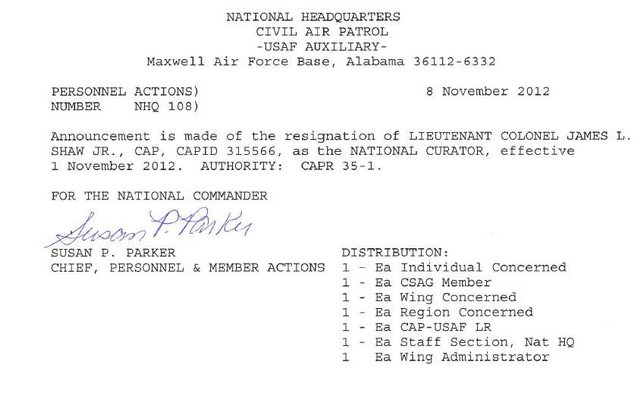 On November 1st 2012, Lt Col James L. Shaw of Albany Georgia was removed from the position of CAP National Curator as documented by Susie Parker, Chief of Personnel and Member Actions. Shaw was sent down from the NHQ-999 National Headquarters Squadron to be billeted in the Albany Composite Squadron in Albany, GA. See Figure #9. 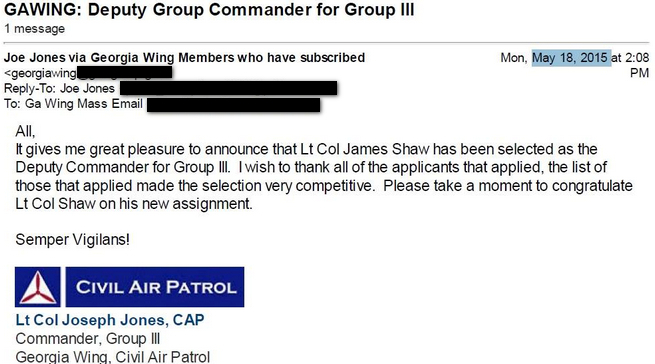 On May 18th 2015, after years of concealment, misdirection and false reporting to higher authorities by Wing and CAP National staff, Lt Col James L. Shaw was appointed to Deputy Commander of Group III in Georgia Wing as approved by Col Richard Greenwood. See Figure #10. To this day, the Winship Nunnally uniform is still missing as well as many other priceless historical artifacts of the CAP that were purchased by Federal funding (taxpayer dollars). Lt Col Jim Shaw is no longer on the CAP history staff, but he is still an active member. In retaliation, Lt Col Mark Hess who filed the IG Complaint on Shaw was later terminated by Shaw’s close friends, Col Richard Greenwood (Georgia Wing Commander), Maj Gen Chuck Carr (National Commander) and Col Frank Blazich (National Historian) to cover it up. 8 Comments on "Stolen Public Donations: The Shaw, Carr & Greenwood Saga"
It may be not a big deal to the average member, but a great amount of our great history has been lost to these thieves while Carr, Gloyd, Parris and others gave them a free pass. It ain’t right, period! Not sure why you have not published it yet, but you were sent an important exchange from a credible former member about Jim Shaw’s conduct with CAP artifacts, donations and the CAP Historical Foundation and the protection of the Greenwood Silver Medal of Valor club. That story is important in confirming Kirby’s statements about CAP covering up even the most rotten abuses for each other. The methodology of theft is very simple and involves five distinct steps. First, plan the theft. Second, recruit allies. Third, pitch or justify the theft. Fourth, carry out the theft. And finally, cover up the theft. * The CAP has NO authority to investigate crimes. Absolutely NONE. * The CAP’s own written and published rules and regs clearly state that if, in the course of a CAP IG investigation, anything with the faintest whiff of a crime is discovered, the investigating officers are to stop the investigation immediately and report to the CAP General Counsel. * CAP members cannot act in a law enforcement role or impersonate law enforcement officers in any capacity. .
* A confidentiality/non-disclosure/read-in document cannot be used to cover up a crime. * A gag and seal order cannot be used to cover up a crime. * The law requires that if crime is found in the discovery for a lawsuit, that suspected crime must be reported to law enforcement. * Any act in the service of facilitating or covering up a crime may be aiding and abetting which is a felony on its own. When we first broke this story in “News of the Force,” the CAP denied all of it, calling it “fake news,” but it wasn’t. National HQ finally admitted the facts to us, but said, “The CAP Historical Foundation is not a CAP entity, but they are allowed to use our name. CAP members can also be members of the CAP HF, but we have no control over it.” Really? One wonders what happened to that “conduct unbecoming” thing. Because our story went public, the CAP HF was disbanded. “A CAP IG officer involved in the complaint told me that Lt.Col. Jim Shaw will see his CAP membership terminated at the end of the investigation. But, as one CAP IG officer told me today regarding Lt.Col. Ray Lyon, there’s nothing in the regulations that say specifically that a CAP member cannot impersonate a CAP IG officer, so unless they get something else on Lyon, he probably won’t be terminated. In order to terminate him, a clear violation of the CAP’s regulations must be shown and proven, and the IG we spoke to said, ‘But perhaps we should consider including that prohibition in the regs,” the IG said. The bottom line here is that if anybody else did what he did, he would “without a question” be in prison right now. There would be not have been a CAP investigation (cough, cough.. cover up), but an FBI investigation. I was in the military and handled classified information and I saw people get dishonorably discharged, given article 15’s, court martialed and sent to prison for much less than what he did. This is fact. Once again they are proving that they are above the law. I would never join this arrogant organization. The laws should apply to everyone or they should not be laws. Sounds like they got nothing left to lose–I would go public with a good journalist/reporter and name names if it were me. At least, everyone would know what they know–sort of like the women who are going public about Bill Cosby. They may never get prosecuted, but in the court of public opinion/standing, he is not doing so well.